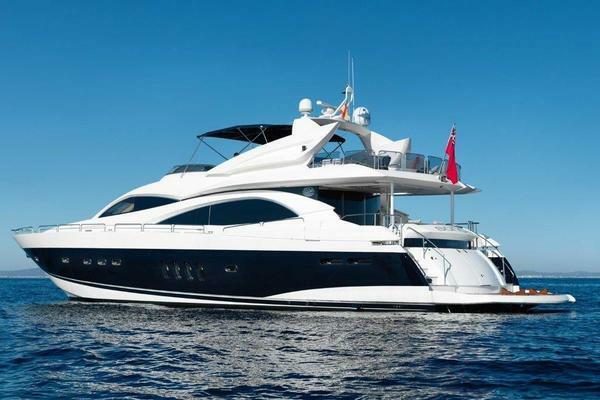 Best 80 Azimut in the Market! Powered by twin MAN V12 1800 HP diesels and has nearly 6'5" of clearance in the engine room. ONLY 60 HOURS! She is equipped with Twin 29kW Onan generators. The aluminum fuel tanks are outboard and have a capacity of 788.5 gallons each. The Side-Power thruster control unit is easily accessible on the port side above the fuel tank and powers both the thrusters and Mitsubishi/CMC zero speed stabilizer fins. Both CMC control units are located on the forward bulkhead of the engine room just above the main engines. The bow is another great place for entertaining and spending time in the sun. The teak continues down the wide side decks all the way forward. You will also notice as you make your way through that there are boarding doors to port and starboard. Undoubtedly the most impressive space on Morning Star is her flybridge. The 20 foot beam is very evident in this area. To port is another summer galley area that features a second double Kenyon grill, freshwater sink, Water maker, Vitrifrigo ice maker and Vitrifrigo fridge. Morning Star´s cockpit is covered in beautiful teak and has a beautiful Stemar upholstered U-shaped dinette with large teak table. The Williams T385 S Turbo jet tender is easily launched from the platform with plenty of room to move about while she is loaded. The crew features a private captain's cabin, separate head and bunk room for 2 additional crew members. Just forward of the crew area is the walk-in engine room. As you make your way aft down a few steps from the forward staterooms, you enter the full beam master. There are 2 linen closets, a hanging locker and a seating area to starboard as you walk into the stateroom. The storage does not stop there, however. The walk-in closet is located on the port side with plenty of drawers on the forward bulkhead. Morning Star features his and hers washrooms in the master conjoined by a spacious teak, walkthrough shower with waterfall head. Both sides have their own vanities with full-sized sink basins. 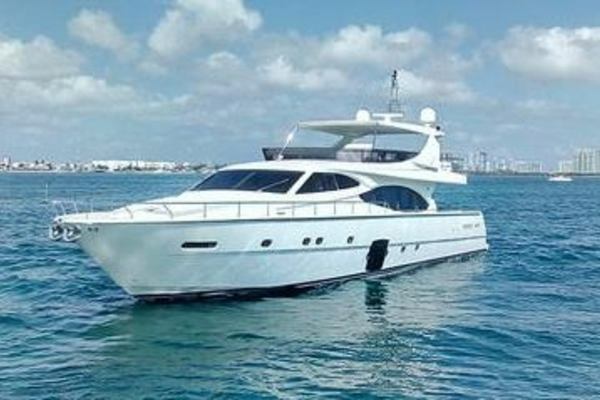 The starboard side has a completely separate bathtub and the Tecma head and bidet are situated to port. Morning Star is equipped with twin 15 inch Raymarine E series touch screens plotters and have AIS, radar and autopilot integrated. If you prefer to use the Side-Power thrusters independently there is a separate control with its own digital screen. The Naviop ship computer is also located on the helm and controls all of the electrical systems on board while allowing you to check tankage levels, bilge pumps etc. There is an additional Naviop screen in the crew cabin as well as the upper helm. Each 1800 V12 MAN has its own LCD screen and allows the captain to view all engine data. The Mitsubishi/CMC fin stabilizer system also has its own LCD display on the starboard side of the helm. As you make your way forward from the salon, you will notice the desired day head to port and galley entrance to starboard. The galley is outfitted with a full-sized Mabe refrigerator/freezer, 4-burner Miele cooktop, Miele convection over/microwave and large stainless sink. The custom Azimut dishware storage area is located next to the refrigerator and can serve up to 10 guests. The storage is more than adequate. Floor to ceiling windows and beautiful decor. Dark wood cabinetry that is nicely accented with light colored furniture and soft, blue wall coverings. To port and starboard are full-sized sofas and a barrel chair aft.